Today Madi got her first cast to correct her clubbed foot. Dr. Segal uses the ponsetti method of casting which involves slightly moving the foot a little at a time and releasing the heel cord to correct the foot. We waited 3 hours at CRS (Children's Rehabilitative Services) before we even got in to see the doctor but both Madi and Conner did great! 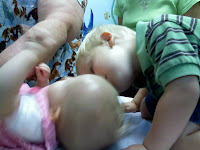 Conner was very sweet and kept kissing "sissy" to make sure she was ok. He was a bit sad that he didn't get a cast himself, but I wouldn't be surprised if our crazy little man ended up with some kind of cast at some point in his life. Madi is doing great with her new cast and is finally taking a nap after a long day! She did take a short nap all wrapped up on mom, so thankfully she remained pretty happy throughout the whole thing. We go back in two weeks to get a new cast put on. We are very thankful to have the casting option available to us so that another surgery is not required!